Powerful, Easy-to-use and Cost-effective Data Recovery Software for users who need to recover or undelete lost data on a computer or server. The R-Data Recovery Studio is a comprehensive data recovery and undelete program renowned for its ability to recover mission-critical data lost to viruses, malicious attacks, and hardware failures or operating system crashes. It supports It supports It supports FAT/NTFS (All Windows), exFAT(WinMobile, Windows Vista and Windows 7), HFS/HFS+ (Mac), UFS1/UFS2 & Ext2FS/3FS/4FS file systems and functions on local and network disks, even if partitions are formatted, damaged or deleted. All 64-bit Windows versions are supported. Additional file recovery algorithm increases the quality of file recovery and recovers files not recognized in file system metadata. Dynamic disk and RAID (including RAID 6) are supported as well as recovering encrypted files, compressed files and alternative data streams. Files and file systems structures (NTFS/FAT boot sectors, MFT file record, MBR, LDM structures, etc) can be viewed and edited in the professional disk hex editor. In addition to byte to byte copy of any object visible in the Drives panel, smart copy of partitions and hard drives with size and offset adjustment is available. Extended Viewer Plugin allows viewing a content of the found files to estimate recovery chances prior to purchasing. Flexible parameter settings give you absolute control over data recovery. You are able to recover files: Deleted without Recycle Bin, or when Recycle Bin has been emptied; Removed by virus attack or power failure; After the partition with the files was reformatted, even for different file system; When the partition structure on a hard disk was changed or damaged. In this case, software can scan the hard disk trying to find previously existed partitions and recover files from found partitions. From hard disk with bad sectors. The R-Data Recovery Studio can first copy the entire disk or its part into an image file and then process such image file. R-Data Recovery Studio run in the demo mode allows you to evaluate how the utility recovers lost files. The only limitation is you can not recover files larger than 64KB in the demo mode. All R-Data Recovery Studio versions (except the technician version) are registered on on-the-fly and no reinstallation required. Depending on the registration key the software is activated to local or network version. When R-Data Recovery Studio run in the demo mode has found a lost file larger than 64KB you may simply double click the file to preview it. If you are satisfied with the file content you may buy the R-Data Recovery Studio license, register the software and recover the file right away. 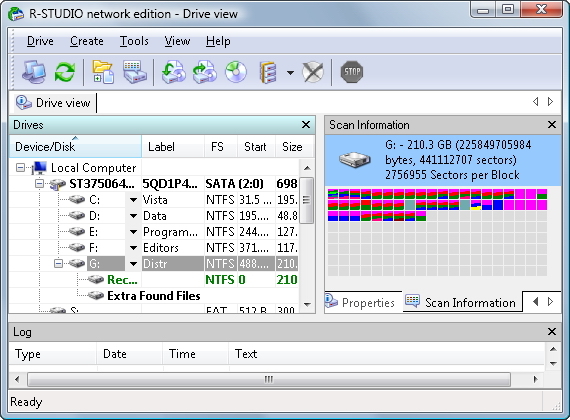 Besides compatibility with all 32-bit Windows (Windows95-Windows 7) the R-Data Recovery Studio (+ 64-bit) version supports 64-bit Windows and allows to use all physical memory (RAM) installed on such computers that highly increases a scan performance especially on high-capacity disks. R-Data Recovery Studio Technician package setup files can be downloaded by the software licensee only. R-Data Recovery Studio for Mac run in the demo mode allows you to evaluate how the utility recovers lost files. The only limitation is you can not recover files larger than 64KB in the demo mode. R-Data Recovery Studio for Mac is registered on on-the-fly and no reinstallation required. Depending on the registration key the software is activated to local or network version. Most of the image files can be previewed when R-Data Recovery Studio for Mac is run in the demo mode. If a found image file is larger than 64KB you may simply double click the file to view it. If you are satisfied with the file content you may buy the R-Data Recovery Studio for Mac license, register the software and recover the file right away. R-Studio ist ein Produkt aus der Familie der leistungsfähigen und kosten-effektiven Software zum Löschen und wiederherstellen von Daten. Mit seiner neuen Wiederherstellungstechnik ist es eines der besten Programme, wenn es um die Wiederherstellung von Daten auf FAT12/16/32, exFAT(WinMobile, Windows Vista and Windows 7), NTFS, NTFS5 (erstellt oder aktualisiert von Windows 2000/XP/2003/Vista), Ext2FS/3FS/4FS (LINUX-Dateisystem) und UFS1/UFS2 (FreeBSD/OpenBSD/NetBSD) geht. Es funktioniert sowohl auf lokalen wie auch auf Netzlaufwerken, dabei ist es egal, ob die Partitionen formatiert, beschädigt oder gelöscht wurden. Mithilfe von flexiblen Parametern haben Sie die volle Kontrolle über die Wiederherstellung der Daten. R-Studio est une famille de logiciels puissants et rentables d'annulation de suppression et de récupération de fichiers. S'inspirant des nouvelles innovations technologiques en matière de récupération de données, il représente la solution la plus complète pour la récupération des données à partir des partitions FAT12/16/32, exFAT(WinMobile, Windows Vista and Windows 7), NTFS, NTFS5 (créées ou mises à jour par Windows 2000/XP/2003/Vista), HFS/HFS+ (Macintosh), les variantes Little et Big Endian de UFS1/UFS2 (FreeBSD/OpenBSD/NetBSD/Solaris) et Ext2FS/3FS/4FS (Linux).. Elle fonctionne sur les disques locaux ou en réseau, même si les partitions ont été formatées, endommagées ou supprimées. La flexibilité du réglage des paramètres vous assure un contrôle absolu sur la récupération des données. R-Studio es una familia de programas poderosa y rentable de reestablecimiento y recuperación de datos. Dotado con nuevas tecnologías únicas de recuperación de datos, es la solución de recuperación de datos más exhaustiva para recuperar archivos de FAT12/16/32, exFAT(WinMobile, Windows Vista and Windows 7), NTFS, NTFS5 (creados o actualizados por Windows 2000/XP/2003/Vista), HFS/HFS+ (Macintosh), variantes de formatos Little y Big Endian de UFS1/UFS2 (FreeBSD/OpenBSD/NetBSD/Solaris) y particiones Ext2FS/3FS/4FS(Linux). Funciona en discos locales y de red, aun si tales particiones están formateadas, dañadas, o han sido eliminadas. Los ajustes flexibles de parámetros le dan control absoluto en la recuperación de datos. Es la mejor solución de recuperación de archivos para ingenieros de sistema, administradores de red y analistas de sistemas. Puede servir fácilmente a sus clientes o servidores (incluyendo LINUX) y recuperar datos perdidos a través de la conexión TCP/IP (o cualquier protocolo compatible en Microsoft Network). R-STUDIO Network recupera archivos de particiones FAT12/16/32, NTFS, NTFS5 en discos duros locales y a través de la red (creados o actualizados por Windows 2000/XP/2003/Vista), exFAT(WinMobile, Windows Vista and Windows 7), HFS/HFS+ (Macintosh), variantes de formatos Little y Big Endian de UFS1/UFS2 (FreeBSD/OpenBSD/NetBSD/Solaris) y Ext2FS/3FS/4FS (Linux). R-Studio это группа надежных, эффективных и рентабельных утилит для восстановления данных с жестких дисков, а также других устройств - таких, как CD, DVD, дискет, USB дисков, ZIP дисков и устройств флеш-памяти (Compact Flash Card, Memory Sticks). Основанная на новейшей уникальной технологии анализа информации на носителе и обработки данных, R-Studio является наиболее исчерпывающим программным решением из доступных на рынке утилит восстановления для файловых систем FAT12/16/32, exFAT(WinMobile, Windows Vista and Windows 7), NTFS, NTFS5 (созданных или изменненых в Windows 2000/XP/2003/Vista), HFS/HFS+ (Macintosh), Ext2FS/3FS/4FS (файловые системы LINUX), а также разделов UFS1/UFS2 (файловые системы FreeBSD/OpenBSD/NetBSD/Solaris). Программа функционирует как на локальных, так и на удаленных компьютерах по сети, даже если разделы дисков были форматированы, повреждены или удалены. Программа поддерживает динамические диски, а также все RAID включая современные RAID 6. Удобный в установке параметров интерфейс программы дает пользователю абсолютный контроль над процессом восстановления данных. R-Studio Data Recovery è un programma che permette il recupero dei dati che sono stati cancellati o danneggiati accidentalmente. Sicuramente uno dei migliori applicativi per quanto riguarda il settore del ripristino dei dati è proprio R-Studio Data Recovery. Questo programma, prodotto dalla software house R-tools Technology, infatti è uno strumento dalle mille potenzialità che comprende anche un supporto completo per le partizioni FAT12/16/32, NTFS, NTFS5, exFAT(WinMobile, Windows Vista and Windows 7), Ext2FS/3FS/4FS (Linux). R-Studio Data Recovery, inoltre, racchiude moltissime funzionalità quali ad esempio la ricostruzione di segmenti RAID ed il supporto per il Virtual RAID, il recupero di files anche dopo l' esecuzione di FDISK, o a seguito di attacco virus, o quando l'MBR è distrutto, e tantissime altre ancora. R-Studio er et af de bedre data recovery og undelete programmer til Win95/98/ME/NT/2000/XP/2003/Vista. Den kan redde filer på både lokale og på remote over f.eks. et netværk. Producenten siger at det ikke gør noget at partitionen er i stykker eller slettede. Kan også redde data efter FDISK, FAT skade eller virus angreb. Begrænsningen på denne demo gør at den ikke kan redde filer større end 64KB. R-STUDIO is gemaakt om data terug te halen die verwijdert is of staat op beschadigde hardeschijven. Het werkt op bestandsindelingen zoals FAT12/16/32, NTFS, NTFS5, exFAT(WinMobile, Windows Vista and Windows 7) and Ext2FS/3FS/4FS (Linux) file system. Dit programma is bedoeld voor de ervaren computergebruiker en gebruikt in de handleiding en helpbestanden dan ook jargon die u dient te begrijpen. Възстановяване на дискове и файлове. Добрата програма за възстановяване на FAT12/16/32, NTFS, NTFS5, exFAT, HFS/HFS+, UFS1/UFS2, Ext2FS/3FS/4FS форматирани дискове, изтрити фаилове. Стига вече тревожене как да въстановите изгубената информация. Zbiór narzędzi do zaawansowanej obsługi dysku twardego. Program potrafi odzyskiwać skasowane dane, tworzyć i otwierać obrazy dysków, a nawet łączyć ze sobą partycje w wirtualną partycję. Oprócz tego aplikacja wyświetla nader obszerne informacje o diagnozowanym dysku, np. rozmiar, rozmiar sektora, przesunięcie partycji, rozmiar partycji i jej typ oraz wiele innych. Wersja demonstracyjna programu umożliwia odzyskanie plików o rozmiarze do 64 KB. R-Studio gelişmiş bir bilgi kurtarma ve slinen dosyaları geri alan bir yazılımdır. 49.99$ Bedelle satılmakta olup bu download deneme sürümüdür, kısıtlı özelliklere sahiptir. FAT12/16/32, NTFS, NTFS5 (Windows 2000/XP/2003/Vista tarafından oluşturulmuş yada güncellenmiş), exFAT(WinMobile, Windows Vista and Windows 7), Ext2FS/3FS/4FS (Linux) dosya sistemlerini, mantıksal ya da fizksel diskleri destekler. Localde ya da remote sistemler üzerindeki ya da networkteki bilgisayarlardaki partition sorunlarına (Bozulma ya da silinme) çözüm üretebilmektedir. Fdisk işlemleri sonucu, MBR bozulması, FAT bozulması ya da virüs etkisi sonucu bozulmuş disklere etkili olabilmektedir. Dinamik disk ya da RAID desteği vardır. şifrelenmiş ya da sıkıştırılmış dosya sistemlerini desteklemektedir. Dosya ya da disk içeriği hexadecimal editorde görülebilir ya da değişiklik yapılabilir.